This (English Breakfast Society approved) traditional English pork sausage recipe will teach you how to make the kind of bangers that you would find in a traditional full English breakfast. We got this recipe from our Chairmans mother who has been making these sausages for more than 40 years. First things first, prepare your seasoning. Mix together two teaspoons of thyme, three teaspoons of salt, one teaspoon of sage, half a teaspoon of nutmeg, one teaspoon of onion powder, half a teaspoon of mace and one teaspoon of ginger, then mix in two cups of breadcrumbs. Now you can start grinding your meat and fat, make sure its cold with a temperature of less than 30°F and grind the meat through a coarse meat grinding plate, a 10mm plate will be ideal. As long as the meat stays cold, grind it again to make sure its as fine as it can be. Throughout the grinding process it is important that the meat is kept at below 30°F, put the meat back into the freezer for a while if it falls below this temperature. When the temperature of the meat drops down, properly mix in your seasoning with your hands to make sure it is thoroughly mixed in, then put it back in the freezer to cool down to below 30°F again. Once your mix is cold enough you can start stuffing your sausages into the hog casing (pig intestines). Stuff the sausage mix into the casing, it should not be too loose and make your sausages as long as you want them to be, twisting them into sausage links. When you have made a string of five bangers, cut off the link and roll the bangers in your hands to fill out the casing properly and get their shapes nice and rounded. If there are air pockets gently prick the casing with a sterile needle and tighten the link to eject the air and fill out the casing. Keep doing this until you have used up all of your bangers mix and once you have rolled all of your bangers into nice looking sausages, tightened the links and properly tied off the ends. Now hang your links for a couple of hours, if you do not want to hang them you can let them sit uncovered overnight in the fridge, do this before freezing them. Your bangers should stay fresh for a week in the fridge and keep for up to a year in the freezer if you vacuum seal them. Alternatively just cook and eat them! There is nothing quite like the taste of a freshly cooked English pork sausage in an English breakfast, or with mashed potato and onion gravy in Bangers & Mash. 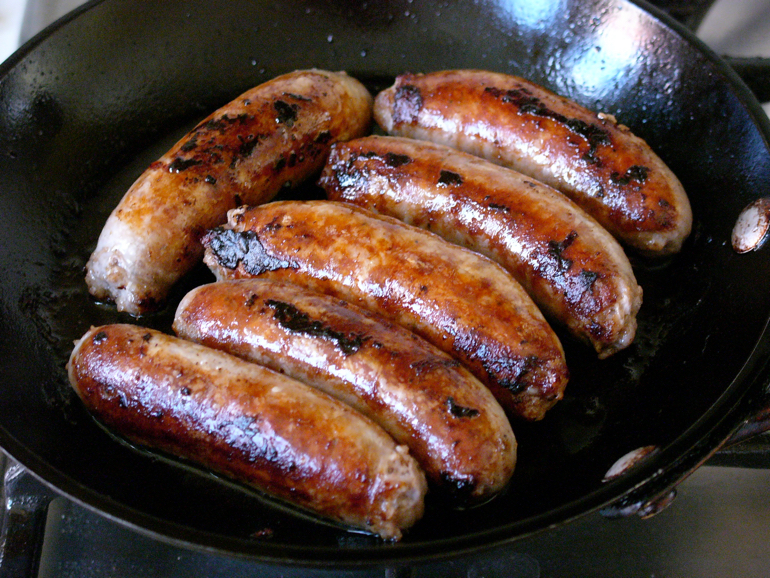 We hope you enjoy this English breakfast sausage recipe, its easily the nations favourite breakfast sausage, even if they are not really bangers that go bang in the pan anymore. Great Britain is one of the worlds leading sausage producing nations, we produce over 400 different kinds of sausages, we have famous sausage producing regions and we even raise special kinds of pig to make the pork in the millions of sausages that we British eat on a daily basis. 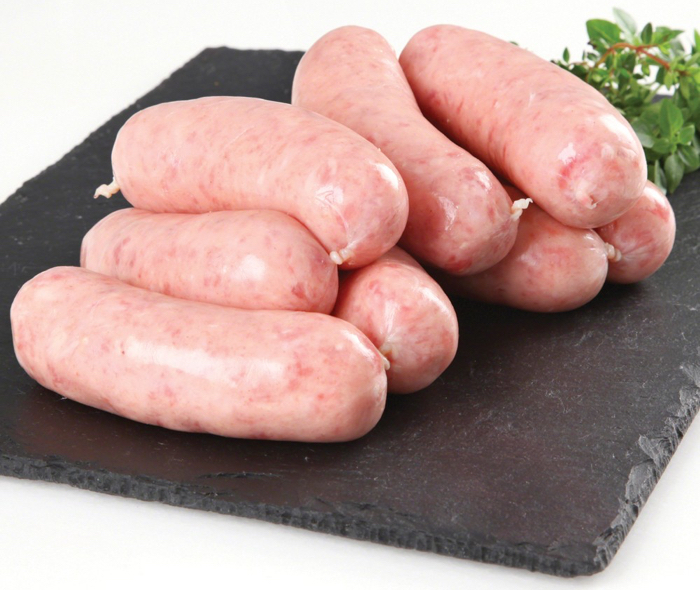 If you are interested in the background and history of traditional English sausages, head over to our British sausage research page and learn more about where the tradition came from. If you are more interested in why they are called bangers, head over to our British bangers research page for a bit more background on the traditional English banger. 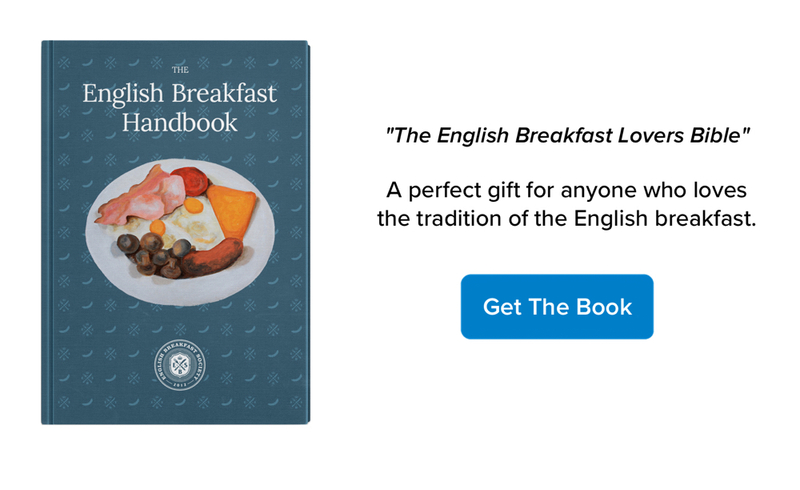 If you are interested in history, heritage and recipes of the traditional English breakfast, check out our official English Breakfast Handbook, lovingly produced by the English Breakfast Society. © 2018 Guise Bule. All rights reserved.